From morning till night some weathered salty sea men fish to classic rock. Wind speeds and wave heights over the world's oceans have been rising for the past quarter-century. It's unclear if this is a short-term trend, or a symptom of longer-term climatic change. Either way, more frequent hurricanes and cyclones could be on the horizon. Ian Young at the Australian National University in Canberra and colleagues analysed satellite data from 1985 to 2008 to calculate wave heights and wind speeds over the world's oceans. They found that winds had strengthened – speeding up over most of the world's oceans by 0.25 to 0.5 per cent, on average, each year. Overall, wind speeds were 5 to 10 per cent faster than they had been 20 years earlier. The trend was most pronounced for the strongest winds. For instance, the very fastest 1 per cent of winds were getting stronger by 0.75 per cent per year, says Young. Average wave height was also on the rise, but less so; and the highest waves showed the strongest trend. The results were compared against conventional measurements taken from deep-water buoys and numerical modelling. "There is variability, but the same general features are observed," Young says. Previous attempts to investigate these phenomena used observations from ships and buoys, but these could generally provide only a regional picture. Using altimeter data from satellites allowed the team to detect decadal trends on a global scale for the first time. Satellite altimeters use radar to measure the height of points on the Earth's surface, and can measure wave height very precisely. Measuring the amount of backscattering from the radar signals, meanwhile, can help calculate wind speed. The global view afforded by the satellites reveals stronger trends in some areas than in others. For example, both wave height and wind speed have been increasing more rapidly in the oceans of the southern hemisphere than in the north. Young can only speculate on what is causing the increases. "If we have oceans that are warming, that energy could feed storms, which increase wind speeds and wave heights," he says. But with a data series that covers just two decades, it's too early to tell whether there's a long-term trend at work. "We don't know the driving force." Considering there are so many regional forces influencing waves and wind, "it's surprising that there is such a uniform trend", says Mark Hemer, a wave researcher at the Centre for Australian Weather and Climate Research in Hobart, Tasmania. Variability in winds and waves associated with weather systems such as El Niño and La Niña, the North Atlantic Oscillation and the Southern Annular Mode could all help to explain it, he says. In either case, if winds continue to strengthen and waves to rise – even if only for a few years – it suggests more intense storms, hurricanes and cyclones are on the horizon, says Young. However, Tom Baldock, a coastal engineer at the University of Queensland in St Lucia, Australia, says that although there is no reason to doubt the analysis, it doesn't mean more coastal natural disasters will necessarily ensue. "Tornados, hurricanes and cyclones occur through complicated regional weather conditions, and are not just related to wind speed and wave height," he says. For example, there are higher wind speeds at high latitudes, but most cyclones hit around the equator. The new study may be more relevant to the burgeoning offshore gas, wind, wave and tidal power industries, Baldock thinks. "Larger waves are a hazard for any offshore construction." Cat Island is one of 29 islands, 661 cays, and 2,387 islets that form the Commonwealth of the Bahamas. Named San Salvador prior to 1925, Cat Island has been put forward as a candidate for where Christopher Columbus may have made his first landfall in the Americas. Mount Alvernia—the highest point in the Bahamas, with an elevation of approximately 63 meters (206 feet) above sea level—is located on the southeastern part of the island. Like most other islands in the Bahamas, Cat Island is located on a large depositional platform that is composed mainly of carbonate sediments and surrounding reefs. The approximately 77 kilometer-long island (48 miles) is the part of the platform continuously exposed above water, which allows for soil development (brown to tan areas) and the growth of vegetation. Shallow water to the west-southwest (below the island in this view) appears bright blue, in contrast to the deeper ocean waters to the north, east, and south. In this astronaut photograph, the ocean surface near the southeastern half of the island has a slight grey tinge due to sunglint, or light reflecting off the water surface back towards the International Space Station. Small white cumulus clouds obscure some parts of the island. Cat Island is inhabited, and had a total population of 1,647 in 2000, according to the Department of Statistics of the Bahamas. The smaller island of Little San Salvador to the west is privately owned and used as a port of call for cruise ships. Cat Island may have derived its name from Arthur Catt, the famous British sea captain or notorious pirate. A competing source for the name are the hordes of wild cats that the English encountered here on arrival in the 1600s. The cats were said to be descendants of their tamer cousins orphaned by the early Spanish colonists in their rush to find the gold of South America. This boot-shaped, untamed island is one of the most beautiful and fertile of The Bahamas. A lush sanctuary, it provides tranquility for those seeking an escape from the pressures of modern civilization. Others thought so too, like Father Jerome, a penitent hermit who built a medieval monastery hewn from the limestone cliffs atop 206-foot Mt. Alvernia, a place for meditation. From these high cliffs, there is a marvelous view down to densely-forested foothills and 60 miles of deserted pink-and-white-sand beach. Cat Island was once home to one of the more prosperous Loyalist colonies of the Out Islands. The island gained its wealth from the numerous cotton plantations established during the 1700s. Now, vine-covered, semi-ruined mansions and stone walls from farms where cattle were penned and pineapples grown, play hide and seek within the tropical flowers, grass and sand. Crumbling remnants of slave villages and artifacts in Arawak caves whisper of a life long past. Descendants of those early settlers remain in the same towns of their ancestors. Photographer Brian Skerry shoots life above and below the waves -- as he puts it, both the horror and the magic of the ocean. Sharing amazing, intimate shots of undersea creatures, he shows how powerful images can help make change. Using the camera as his tool of communication, Brian Skerry has spent the past three decades telling the stories of the ocean. His images portray not only the aesthetic wonder of the ocean but display an intense journalistic drive for relevance. Skerry’s work brings to light the many pressing issues facing our oceans and its inhabitants. Typically spending eight months of the year in the field, he often face extreme conditions to capture his subjects. He has lived on the bottom of the sea, spent months aboard fishing boats and dived beneath the Arctic ice to get his shot. He has spent over 10,000 hours underwater. Spring is around the corner and nearly 13 million registered boaters in the U.S. are priming to hit the water. As part of their preparations, boaters need to make sure that they have the latest NOAA nautical charts on hand to avoid groundings or accidents while navigating along the coast. With modern technological advancements, obtaining the latest chart is easier — and more important — than ever. “Sailing the oceans and Great Lakes doesn’t have to be a voyage into the vast unknown of ages past,” explained Capt. John Lowell, director of NOAA’s Office of Coast Survey. Because storms alter seafloors, and water depths constantly change due to shifting shoals and submerged hazards, NOAA’s Office of Coast Survey is charged with maintaining the nation’s suite of over 1,000 nautical charts, covering about 3.5 million square nautical miles of ocean coasts and the Great Lakes. NOAA updates its charts weekly using hydrographic survey data that is collected by the agency, along with the most current U.S. Coast Guard Local Notice to Mariners, National Geospatial-Intelligence Agency Notice to Mariners, and other critical safety information reported by commercial mariners or other sources. While some traditionalists enjoy manually applying important new changes made after the chart was published, applying updates to paper charts can be time-consuming, tedious and error-prone. 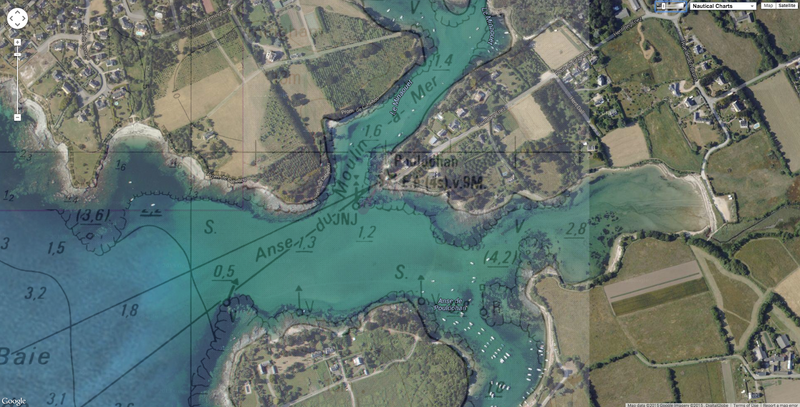 One of the most important and convenient navigational products is the official “print-on-demand” (POD) nautical chart. Through a private-public partnership between NOAA and chart publisher OceanGrafix over the past 10 years, boaters can purchase “print-on-demand” nautical charts that cover the latest updates, issued as recently as the prior week. This year, the NOAA partnership has expanded and, for the first time, boaters can purchase National Geospatial-Intelligence Agency (NGA) charts covering the open ocean from OceanGrafix. “Conscientious boaters know nothing replaces the peace of mind that comes with having an accurate paper chart on board,” explained OceanGrafix president Ron Walz. A POD chart is printed at the time of purchase and contains chart updates up until the time of purchase. When a customer orders a chart from an OceanGrafix agent, the chart is printed and shipped within one day. NOAA certifies OceanGrafix print-on-demand charts for navigational use. NOAA is a proud sponsor of Alliance for Safe Navigation, which maintains a website that lets mariners check to see the latest changes to NOAA charts. Nearly 10,000 visitors flock to the Okinawa Churaumi Aquarium each day, most hoping to catch a glimpse of giant whale sharks feeding. The public has its opportunities to watch the whale sharks daily, with feeding times at 3pm and 5pm. Churaumi, Asia’s largest aquarium—and fourth largest in the world—is an aquatics leader in keeping the giant whale sharks, which grow to lengths of more than 14 meters (46 feet). The excitement of viewing whale sharks—and giant mantas, too—in the 'Kuroshio Sea' tank - Kuroshio means Black Current - has become even more of a thrill with the inclusion of a new female whale shark. In-tank breeding of whale sharks under captive conditions is the direction Churaumi is now moving. Initially, the aquarium kept three male whale sharks, and the new swimmer in the pool is a female whale shark that replaced one of the males for in-tank breeding. The female whale shark was captured in a stationary fishing net off the shoreline of Yomitan Village, then cared for in a keeping net offshore of Yamagawa Port in Motobu. She was 5.2 meters (17 feet) long when captured. Whale sharks are presumed to be sexually mature when they are 9-10 meters (30-32 feet) long. The female whale shark now swimming in the Kuroshio Sea tank has grown to 5.7 meters (19 feet) and weighs 1.3 tons (2,916 pounds). The Okinawa Churaumi Aquarium, located in Motobu on the northwest Okinawa coast, is part of the Ocean Expo Park. The state-of-the-art facility opened in 2002, replacing the older, smaller Expo aquarium, and has been the first in the world to be successful in breeding mantas in an artificial environment. A day at the Okinawa Churaumi Aquarium provides visitors a firsthand exposure to the underwater ecosystems that exist around the Ryukyu Islands. The aquarium’s giant Kuroshio Sea tank holds 7,500 cubic meters of water, and is home to 16,000 fish. Visitors watch the whale sharks, the largest inhabitants, and graceful manta rays as they glide through the waters, through the world’s second largest acrylic panel. The 8.2 meters by 22.5 meters panel, 60 centimeters thick, provides a panoramic view of underwater nature. The aquarium’s main facility spans four floors, with the “Life in Inoo” touch pool near the entrance on the third level. Here, visitors can touch and handle starfish, shells, sea cucumbers and other species native to lagoons in Okinawa’s coral reefs. The curving ramp winds its way down to the first floor, allowing visitors to survey the sea life that reside near the shore, and on into deeper levels. The Coreal Sea tank and the Tropical Fish tank are open on top, permitting the sun’s rays to penetrate into the aqua waters. From the second floor, guests can move back-and-forth between the Churaumi Theater and jewel tanks to learn about colorful fish, giant lobsters and eels, and smaller sea life. The second floor is also home to the Shark Research Lab, a place where again, hands-on opportunities exist to touch and feel the texture of shark skin and teeth. The special shark tank has bull sharks and other dangerous shark species swimming.